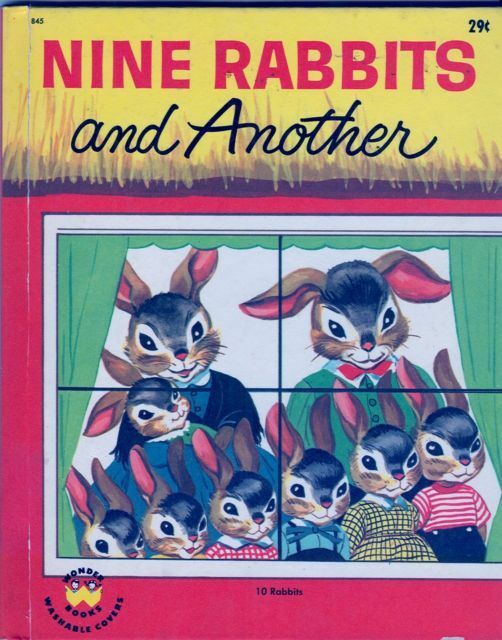 Nine Rabbits and Another, Vintage 1957 Wonder Books Nine Rabbits and Another; Miriam Clark Potter, Author; Vintage, 1957 Wonder Books; Children’s Easter; Washable hardback covers; Illustrated; Printed in the USA; NINE RABBITS AND ANOTHER Vintage Wonder Book 1957 By Miriam Clark Potter; Illustrations By Rachel Taft. Hard Back; Books measures app. 8” H x 6” W. Original cover price: 29 Good Condition. No Writing. No Tears. Minor Wear At Spine and on the edges and corners of the covers. Binding is a little loose but nothing is coming apart. There is a name written inside the front cover on the 'This Book Belongs To'. Pages are in good condition. No rips, tears or writing of any kind. Just some normal aging. Vintage Wonder Books from 1957. The book is in great condition although slight tanning with age. Inside cover has previous owner’s name. Tight Binding. Glossy covers; Clean pages-no rips, tears or stains. see all my Easter books, bunnies, tins and items.